First off, apologies all around for us not having updated the website for nearly three weeks. While our postings are generally a bit sporadic due to our travels, three weeks is just crazy talk. But rest assured that in the coming week or two you’ll be hearing many stories of our travel adventures that have happened since our visit to Machu Picchu (including one involving a local man selling the herbal equivalent to Viagra during a 9 hour bus ride through the Amazon jungle). Tim and I have so many plans for the website, we get really excited every time we day dream about it. We have probably hundreds of different posts we want to write, many of which we think we’ll add upon our return back to the US. (And hopefully you all will still be interested in reading more stories even though we’ll already be home safe and sound.) We figure that if we continue writing about our travels after we go home then we can keep living our dream a bit longer. Sounds reasonable, right? Anyway, the majority of our posts right now center on our travel experiences: where we’ve been, what we’ve seen, who we’ve met, etc. This, of course, makes sense since we’re traveling right now. But of course there’s a lot more to this round-the-world travel than just what we’ve seen. There’s the planning before the trip (which as many of you remember was almost a full-time job for us) and the logistics during the trip too. There are the “how to explain to the hotel that you’ve blown out the power for the third time in one week and get out of not paying for the electrician” sort of posts. Or the “two pairs of underwear for this length of trip really is enough, Mom” posts. And, as any traveler already knows, there are the “anything and everything to do with bathrooms and your visits to them” posts. Speaking of this last topic, let’s take a moment to talk about toilets, shall we? (No worries for those of you with faint hearts: we won’t be talking about what’s in the toilet, just the toilet itself.) You see, Tim and I have been gathering data on South American toilets for five months now and we have a lot to share. But given my close relationship with them (one that will be explored in just a moment but, again, with little detail), I feel some of this information needs to be shared sooner rather than later. Not because I want to complain, of course, but for the sake of all those travelers who come behind (so to speak). So Tim and I visited Peru for five weeks. And in those five weeks we watched condors soar, surfed down sand dunes, climbed the mountain overlooking the lost city of the Incas, and made some wonderful friends. We also adjusted to altitude, learned to haggle, and were attacked by small children trying to sell us finger puppets. Undoubtedly some of our favorite memories from our trip will fall within our time in Peru. But on the other side (or should I say “end”) of things, I was sick with stomach problems for two of our five weeks in Peru. (I was: 1 week healthy, 1 week sick, 1 week healthy, 1 week sick, 1 week healthy…I’m nothing if not consistent.) And by my calculations (calculations involving the tallying of used toilet paper rolls, a crayon, and a stuffed hedgehog), I basically spent four days in Peruvian bathrooms. That’s 96 hours on a toilet. Now, Tim and I have seen some, shall we say, less than desirable toilets in our five or so months of travel. But there is nothing quite like the toilet located at altitude. Altitude, otherwise known as “way too high in the sky and really damn cold” makes toilets feel like giant and unforgiving ice cubes on your very unhappy bottom. And so I challenge anyone to tell me what could be worse than having to sprint to the bathroom every 5-8 minutes complete with fever and horrible body aches for one week straight (cue the sympathetic violins, please)…only to be greeted by an ice cube. An ice cube, I should mention, that doesn’t thaw no matter how long your unhappy bottom visits it. I am fairly certain the only way to make the situation worse is to put a ridiculous Peruvian hat on your head, a hat that you need to wear at altitude because your ears will fall off otherwise. Oh, yeay! So good to read about and see you guys again… "
…even if it is under less than happy (cold bottom) circumstances. brrrr! my bottom is shivering, just reading this! 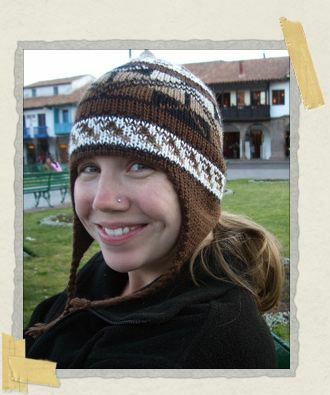 the ridiculous peruvian hats are mighty cute, i have to say. and i miss you both! hope you're feeling well, now. Lots of chuckles this way during that post. Ah yes, toilets…they do come in all shapes and sizes, and apparently temperatures. My most memorable toilet experience was in the backwoods of Australia where a friendly family of GIGANTIC cockroaches inhabited the outhouse-esque facility. Yackes! Feel better and, uh, when are you heading over to the lovely continent of Europe? Wow ya got me. That's sounds pretty craptastic. But could you be any cuter in that top photo? I just wanna hug ya! Love the hat too. Hope you're feeling better by now! I vote for hearing about the herbal Viagra next. Nuff said about that! Thank God for bottled H2O and Charmin! P.S. Picturing British soldiers with holes in the bums of their pants to handle their "pressing business" reminds me of a Monty Python skit gone horribly wrong. Pardon the pun here, but this post is really um… crappy. Reminds me of those bad colitis days, but I won't go into that. Glad to hear that you are well despite suffering a frozen bottom and silly Pruvian hatatitis. May I recomend that you stick to bottled water and plain old Power Bars from now on? However, if it makes you feel any better I had to deal with a mild insect bite induced staph infection this past week. Totally NOT fun! Take care of your self kiddies and don't forget to bring me back a nice red-headded lesbian! TTFN! I'm sorry about the pooing. I, myself, have disturbing poo stories and stories of questionable nature involving sketchy "trainspotting'esque" toilets but I'm just on my way to brekky and I don't think I want to drag those memories back up. Hmm… (Laughing at Philsie) I suppose Timmy could just dress you up in drag and pretend you were a lesbian, but that would just be too weird for me. Funny as heck, but weird nevertheless… Sooo are there any non-male red-heads out there? Actually, I think it's a pretty cool hat! I hope you get fewer sick weeks (or even days) going forward. Of course, I haven't forgotten that it's winter below the equator. And have I ever asked you guys how much you like being upside-down?